I decided to make two cookies: the Peanut Butter Oatmeal Chocolate Chipsters and the Chocolate Chip Cookie recipe, which I have previously made (but I put a new twist on them so look out for a future post of that recipe!). Preheat the oven to 350F and line baking sheets with either parchment paper or silicone baking mats. Whisk together the flour, oats, baking soda, spices, and salt in a separate mixing bowl. Using either a stand mixer or a hand mixer beat together the butter, peanut butter, and the sugars until smooth and creamy. Blend the first egg for one minute before adding the second egg. After blending for one minute, blend the vanilla. Slowly add the dry ingredients to the wet, beating on low until blended together. Stir in the chocolate chunks. If you have time: refrigerate the dough. Otherwise the dough can be used immediately. Drop rounded tablespoons onto the baking sheets about two inches apart from one another. Place one baking sheet in the oven and bake for 13-15 minutes (until cookies are golden brown and the edges are firm). After 7 minutes rotate the baking sheet and continue to bake until finished. Allow cookies to cool for a few minutes before transferring to a cooling rack. I didn’t chill my cookies so they were a bit difficult to shape but otherwise baked great! These cookies are DELICIOUS. The peanut butter flavour isn’t overwhelming, the oatmeal gives the cookies a great texture, and the chocolate chunks just stud the cookies beautifully. There’s a lot going on in these cookies but they all come together in a harmonious way rather than having one ingredient outshine or overpower the others. 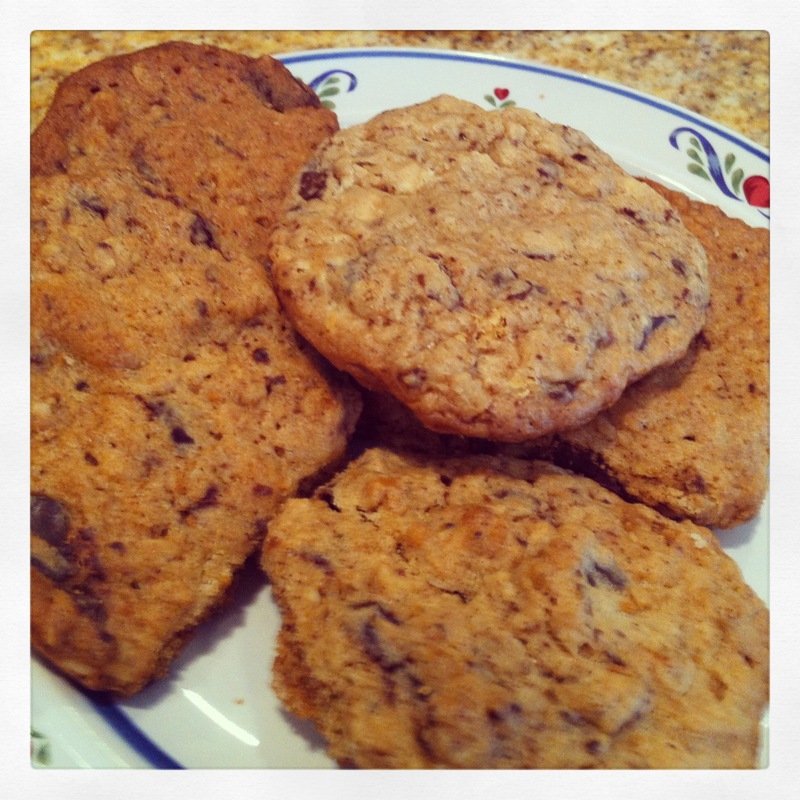 Peanut butter and chocolate is always a winning combination but the oatmeal really knocks this cookie out of the park. If you’re looking for a new chocolate chip cookie recipe this is definitely a winner.